﻿ DVDFab Lightning Recoding, adopted the most advanced encoding and recoding technology, ensures super fast video processing speed. 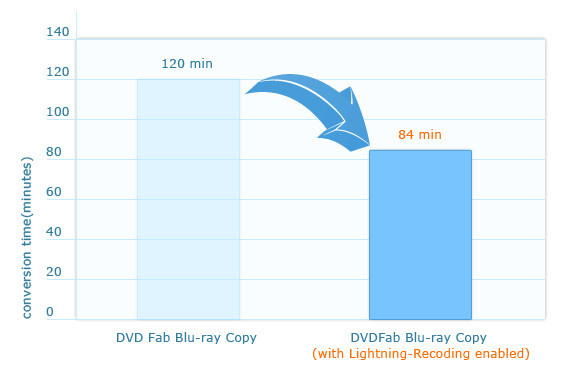 Lightning-Recoding is the break-through technology developed by DVDFab and applied in Blu-ray Copy to greatly improve the converting speed when it comes to compression. It reuses the original information of the source video to decrease the calculating work during compression, thus increase the converting speed to a very large extent -- approximately 40% at maximum. With batch conversion, multi-core CPUs, and NVIDIA CUDA supported on most DVDFab products (including Blu-ray Copy), the converting speed is already extremely fast. However, DVDFab still keeps moving on to develop and apply the homebrew "Lightning-Recoding" in Blu-ray Copy for even better user experience. With Lightning-Recoding, users can copy H264 video in "Full Disc" or "Main Movie" mode of Blu-ray Copy with compression much faster than before. The professional DVDFab test team has done loads of testing work on Avatar and other popular Blu-ray movies to learn the performance of Lightning-Recoding. And it proves to be stable and perform well. The diagram below shows straightforwardly the performance between copying Avatar with and without DVDFab Lightning-Recoding to give you a general idea. The following tables are the detailed information on comparison from a couple of Blu-ray movies in the same environment. *Users who can't get advantage of NVIDIA CUDA technology can obtain a much faster speed from Lightning-Recoding; of course anyone who uses CUDA can also get improvement on performance from it. *About Lightning-Recoding, we've applied for patent, and now it's in patent pending status.